Thermal neutrality. Due to this advantage the house is very warm in any season. Pine log provides substances which have positive influence on the human body and possesses medical properties. It increases vital tone. The pine tree has antiallergenic properties. It provides the scent of the summer forest to the house. It is very pleasant and comfortable to live in it. 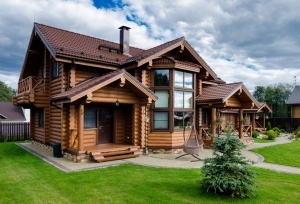 Wooden log houses stabilize the humidity in the room which no one good air conditioning can do. Such house can be built in a very short term and also may be easily transported to the other land plot. It doesn’t need any additional expenses on the inner and outer decoration. Due to such mobility we export wooden houses abroad. The house from the regularized round timber is heated very well. Is fits to all regions with any climate conditions. The wood accumulates warm during summer and saves it in winter. The wood texture creates a unique pattern of the walls. The beauty of wood and the good design creates enormous buildings. Seismic stability. A wooden house is a unique construction which has a seismic stability which is able to stand during the earthquake. You will be surprised by the law price. The manufacturing of the regularized round timber for the house is a very painstaking work. In the very beginning all logs go through the careful inspection and sorting. Spruce logs are considered to be the one of the most expensive ones. The have a miracle-working effect on the human body. The wood works as a natural filter and breathes. Only fresh air which is full of oxygen will be in your wooden house. The next step of the manufacturing is the first preparations of the regularized round timber. Due to the modern equipment we cut the wood layer by layer. The main reason of this is to get the best shape of the wooden material. In the professional language it calls the milling of the montage groove. Our company chooses only best materials. We offer you regularized round timber which will serve long years. It will not lose its shape and will be resistant to negative impacts. The main principles of our company are: quality, speed and credibility.